A program that goes by the name of eAdvisor Ads is a questionable application that we advise you to avoid. Unfortunately, quite a few users are tricked into obtaining this worthless dubious program since its developers use manipulative and otherwise misleading marketing techniques. On its official website, this application is advertised as a tool that should help you with shopping online. Even though it sounds like a great tool to have, you should know that it acts in a rather invasive manner and due to such functionality, it has been classified as an adware program. Having this devious application active on your PC could ruin your online experiences. 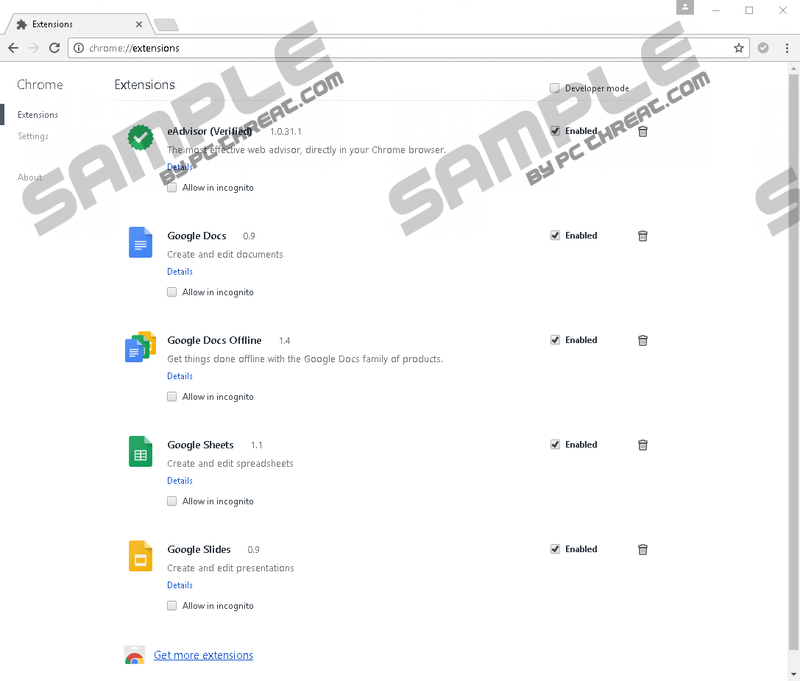 On top of that this ad-supported program could also prove to be the primary reason, other suspicious programs might be able to enter your PC without a lot of trouble. We advise you not to take any chances with eAdvisor Ads and conduct its complete removal using the instructions below. Once eAdvisor Ads enters your operating system it functions in a relatively conventional manner. It installs a suspicious third-party browser extension without any notification, which is annoying, to say the least. 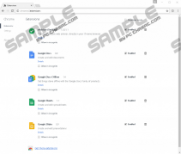 This intrusive plug-in is essential to the overall functionality of this ad-supported program because it establishes a strong and lasting connection to a suspicious adware server. As soon as this is done, you will notice an unusual amount of third-party web content while surfing the web. In the majority of cases, such content manifest as various ads, coupons, and pop-ups. Unfortunately, content provided by this adware program will not be useful in any way. The reality is that all the ads, pop-ups, and coupons are just invasive and will not help you save money while shopping online. It should be quite obvious that such functionality of this devious application will ruin your overall online experience. In severe cases, the amount of dubious content could cause your web browser to crash without any warning. It goes without saying that such functionality of this ad-supported application cannot be tolerated. To break the devious connection and to restore your web browser's default settings once and for all you need to execute a thorough removal of eAdvisor Ads as soon as it is found active on your PC. If you fail to do so, the invasive online content will continue to bother you. Unfortunately, the invasive functionality of eAdvisor Ads is not the worst thing about it. Upon further investigation, our research team has discovered that this adware program could present you with online content embedded with potentially dubious redirect links. This is a dangerous instance as clicking on an advert that hosts a redirect link could lead you to suspicious and even potentially harmful websites. For example, you could end up on a website crafted by malware developers that might be running an arbitrary code execution exploit, which can trigger a remote installation procedure. Thus, in some instances just entering such a site could be more than enough to get your PC infected with some other malware. In other situations, you might find yourself on fake online shops, which are crafted by cyber criminals for a single reason - to steal your credit card data. Even though ads and pop-ups embedded with redirect links do not occur often, it remains a possibility to come across one. Just entering any of the mentioned websites could have detrimental outcomes. It is also important to note that in some cases this adware program could be spread via bundled installers, which are infamous for hosting suspicious software. Thus, if you already have eAdvisor Ads active on your PC, there is a chance that other suspicious programs could be active as well. It goes without saying that a complete removal of this adware program is essential if you wish to have a fully secure system at all times. Do not delay the removal of eAdvisor Ads as you might have to face undesirable outcomes, to put it lightly. Make use of our detailed removal guide and terminate this adware once and for all. If you are being bothered by suspicious third-part ads even after a removal procedure, it could be that some of eAdvisor Ads traces are still active on your PC. To be sure that you have removed this ad-supported program in its entirety, make sure to double-check your operating system for any potential leftovers associated with eAdvisor Ads once you are done with the manual removal. Click the Chrome Menu button and select Settings. Click Reset to confirm your choice. Click the question mark icon at the bottom. Click Refresh Firefox to confirm your choice. Select Internet Options and click the Advanced tab. Check Delete personal settings and then click the Reset button. Quick & tested solution for eAdvisor Ads removal.